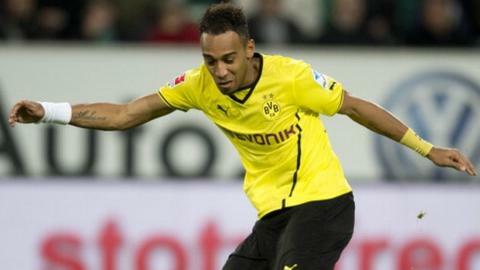 A former youth player at AC Milan, Pierre-Emerick Aubameyang's career took off when joining Saint-Etienne on a permanent basis in 2011. His spell at the club ended in July when he joined Champions League runners-up Borussia Dortmund, effectively replacing Mario Gotze after the much-heralded playmaker's move to Bayern Munich. His spell with Les Verts ended in perfect fashion though, as the club won the 2013 French League Cup - to hand Aubameyang his first piece of silverware as a professional. He did not score in that game but did find the back of the net 19 times in the league, with only PSG's Zlatan Ibrahmovic scoring more, while the Gabonese also registered eight assists. Such impressive form persuaded Dortmund to part with £11m as they snapped up the son of former international Pierre on a five-year deal. He instantly picked up more silverware as Dortmund avenged May's Champions League defeat in London by beating Bayern Munich 4-2 to win the season-opening German Supercup. He duly became only the sixth player to score a hat-trick on his Bundesliga debut as Dortmund opened their league campaign with a 4-0 win at Augsburg. The goals have continued to flow, with Aubameyang settling in remarkably quickly as evidenced by his seven goals from his opening 11 games for Jurgen Klopp's side. While the 24-year-old's club career has gone from strength to strength, 2013 was a frustrating one at international level for Gabon. However, a highlight came when he scored a hat-trick of penalties against Niger in a World Cup qualifier in June, but that was the Panthers' only victory as they stumbled to third place in their group and wrote off a trip to Brazil 2014 in the process.